It's part of a wave of innovations aiming to keep plastic circulating in the economy, which also include a way to turn empty bottles back into raw materials and a new supply chain model enabling the recycling of plastics from electronic waste. Cesar Aliaga from the ITENE Research Centre in Valencia, Spain, says that it's a challenge that can only be tackled if everyone in the recycling industry works together—and the first step is to encourage people to recycle properly. "The aim of the smart collection container is to make it easier for citizens to separate waste," said Aliaga, 'but also to tell who is doing it well and to reward them for this behaviour." But a smart container is just the start—once sensors in the container detect it's full enough, they alert the waste truck, which is optimised for efficiency with both compacting systems and pickup routes based on container and city data fed into a cloud platform. 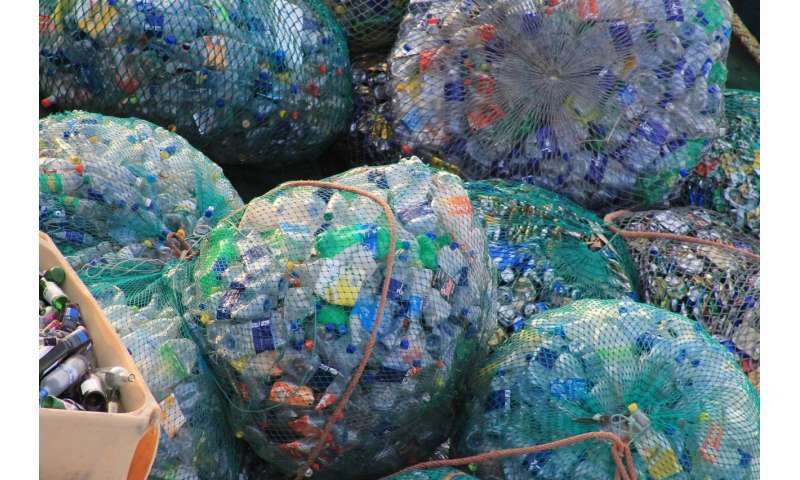 Aliaga says the project's partners are developing an innovative sorting system to more efficiently separate the different plastics collected, combining a range of scanning and imaging technologies with the near-infrared sensing traditionally used to sort plastics. "About 30% of plastic is recycled, but with (most) packaging waste this material is currently only used for low-end applications," said Aliaga. "There is plenty of room to boost reuse of plastics and our idea is to use this in new, high-value applications ... such as automotive parts with Centro Ricerche FIAT, roofing membranes, garbage bags and high-quality urban furniture," he said. If successful, initiatives like this could be vital for hitting the EU's strategic goals for plastics in a circular economy, which aim for all plastics packaging to be recyclable by 2030, in addition to a proposed crackdown banning single-use plastics, like straws and cotton buds. Even ignoring the huge CO2 emissions and environmental impacts this has, let alone the need for oil as an input for the majority of these plastics, Europe is sitting on a potential goldmine—the plastic material lost every year represents €10.56 billion in wasted resources. Garbo is an Italian company that's trying to prove there's good money in making plastic circular. They are tweaking a chemical process known as glycolysis to recycle polyethylene terephthalate (PET), very often the base element of plastic bottles. The current problem, says Garbo's general director Fabio Fizzotti, is that only a small percentage of recycled PET pellets can be used in new bottles, while the low demand for coloured PET bottles and other PET waste sees this go to landfill or incinerators. "Technically speaking, we can recycle any kind of PET, and in the long-term such recovered materials must be cheaper—you cannot convince people to create a project without (an) economic reason," said Fizzotti. "But in Italy, people have to pay several hundred euros per tonne to burn the waste, so at that point, we can be competitive with virgin plastics." "The amount of refuse in Europe is so high that 100 tonnes per day is just a small part of the pie. Even looking at black, carbon-coloured bottles, these are not recoverable with normal recycling methods and there are huge amounts of this just being burnt for thermal recovery." "For costs and benefits, for example, investing in recycled plastics would soon be essentially the same as investing in virgin plastics, with the difference of being able to tap into a fast-growing e-waste stream that contains billions of euros worth of plastic materials," says Nikolova. Their work includes technical innovations such as the development of a purer recycled plastic that removes toxic flame-retardants—thus creating a product appealing to the whole supply chain, from designers to consumers. The project is also developing attractive, colourful demo products to prove that recycled plastics are no longer the grey, inferior products of yesteryear. The specific ideas are still under wraps but partners include Dutch electronics firm Philips and American appliance manufacturer Whirlpool. "Once you have the buy-in from the consumer, this is key as bigger companies will then take the lead in introducing recycled products, followed by competitors and smaller businesses in the supply chain—and then policy-driven incentives help with scaling this recycling up."